Add thyme, lentils, and 2 cups (480 ml // or the smaller end of the range if adjusting recipe size) vegetable broth. Bring to a low boil over medium-high heat. Once boiling, reduce heat to a simmer and cook on low for about 20 minutes, adding more broth as needed if the mixture looks dry. 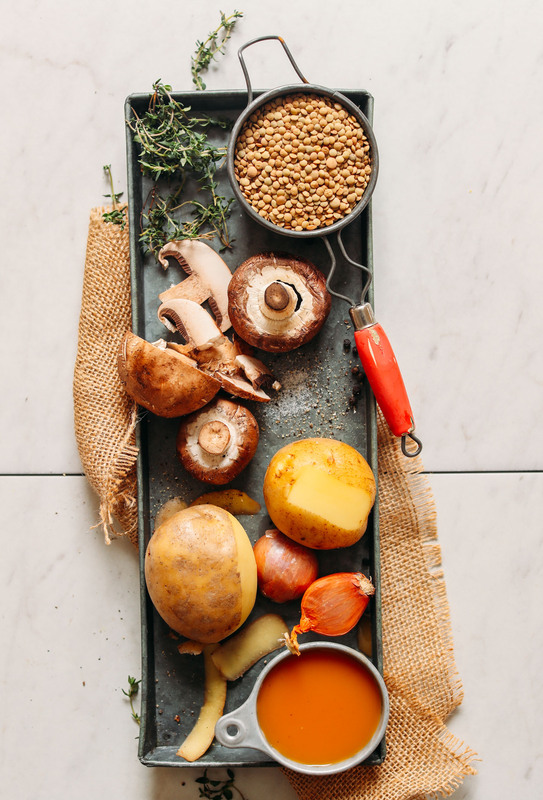 Once lentils are tender, taste sauce and adjust flavor as needed, adding more salt or coconut aminos for saltiness, pepper for spice, or tomato paste for more depth of flavor (optional - we didn't find it necessary). 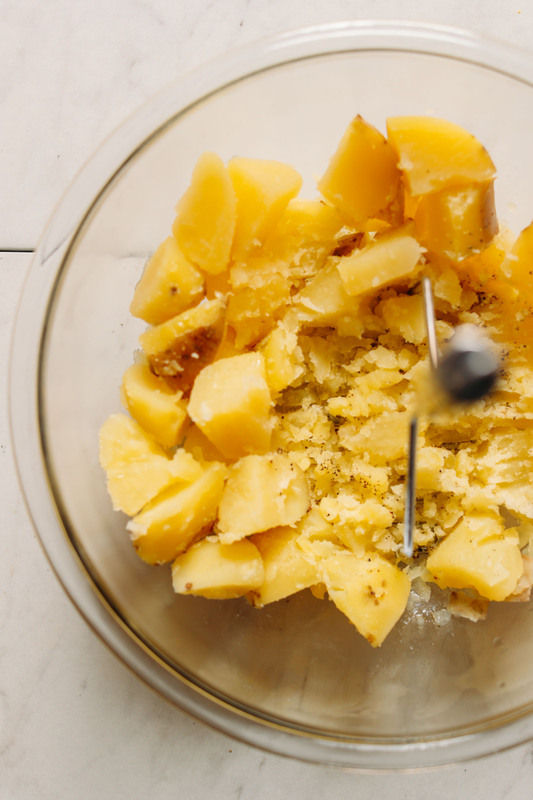 Turn off heat and let the mixture rest so flavors can deepen. Add the 2 Tbsp (30 g // or more as needed) mashed potatoes to the lentil mushroom stew and stir in to thicken. *Nutrition information is a rough estimate calculated with 1 Tbsp oil and without optional ingredients. *As written, this recipe heartily serves 2 as an entrée or 4 as a side. I followed this recipe, mostly to a T, and it was delicious! Major umami flavour. I did use an immersion blender to blend some of the gravy so it was smoother but still had lots of texture. Next time I would cut my mushrooms a bit chunkier. Made this for lunch today! Was enjoyed by all ( Vegan and not alike). I found the stew was a bit thin and needed more potato to thicken than was called for. I will reduce the liquid some next time! I love this recipe, so delicious and comforting. When I make it again, I think I will add more mushrooms. I bought a box of mushrooms that had an additional cup than what the recipe calls for, next time I will use the full box. Letting it sit for a bit definitely deepened the flavors. Hi Barbara, yes, a link is fine, thanks! Please refer to this guide for more information on sharing our recipes. Thanks! One other thing—I made this the night before the dinner party to make life easier…. It heats up great on the stove! No one was the wiser. I’m from the Ina Garten school of “make it ahead”! This is easy to make and tastes great! Thanks for the recipe. I made this the other night and it was a big hit! I used soy sauce instead of coconut aminos and used the tomato paste. Thanks for the great recipe, I’ll definitely be making this again! We loved this recipe! We nixed the tomato paste and used soy sauce in the lentils and dairy elements in the potatoes. We had it with a meat side because it needed to be eaten, but everyone eating felt it could stand on its own as a meal. Finally tried this today after saving to pinterest ages ago. It was absolutely fantastic! I was making it ahead of time, so wasn’t making the mashed potatoes, so instead of mashed potatoes to thicken, I used 2 tablespoons cornstarch beaten with 1/4 cup of water. Worked great. Can’t wait to make again – it was such a warm and hearty dish to eat a cold winter’s evening. I added spinach, which goes so well with mushrooms and lentils. Very flavorful and good comfort food! This is pure comfort food to be sure. I used black lentils that I soaked all day. I added carrots to mine too. I also used my InstaPot to cook the stew. Decreased liquid to 2 cups and cooked the stew for 15 minutes on high. The flavors were perfectly blended. I let the stew bubble on the sauté setting for five additional minutes to further reduce liquids befor stirring in mashed potatoes. I used a combination of red and gold baby potatoes for the mash. I added vegan keifer I made in the InstaPot to give the potatoes a tangy flavor. Yum! This recipe is husband approved. And will definitely make it again and serve over polenta. This has become my favorite deep winter comfort food. I ate it three times in ten days in December and I have been craving it now for over a week. Tonight is the night. 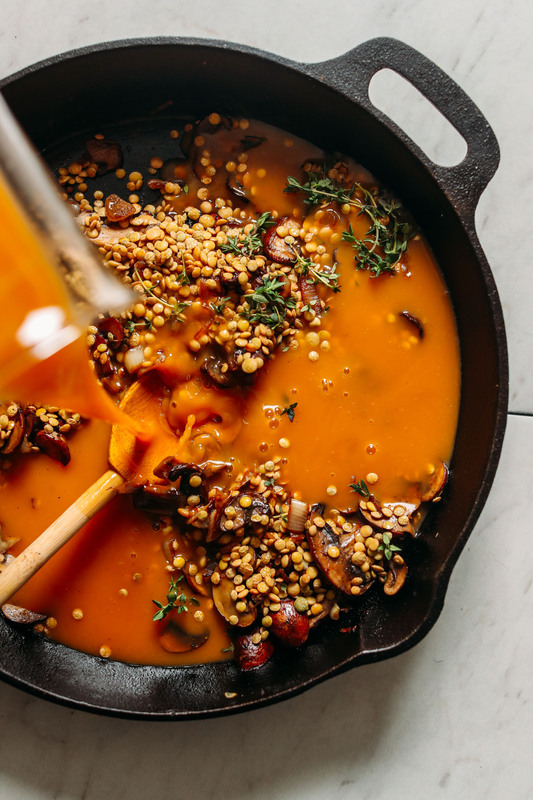 This is FANTASTIC and it is the dish that made me love lentils, finally. Wow! What an amazing surpise. As a recent vegan in conversion, I am still not confident in my cooking, but this recipe came out exactly as described or better: fragrant, delicious, filing and beautiful! Thank you so much!! This has quickly become a favorite dinner in our house, the flavors are unbelievable. Minimalist Baker is my go to for all my recipes and she never disappoints, this was another amazing success that I will be adding to a weekly dinner rotation. I would say if you are planning on having it as a main meal versus a side, I would double the recipe. Hi, how much lentils should I add if they are already cooked? Hi Judy! We recommend using uncooked lentils (or soaked) and adding them along with thyme and vegetable broth for best results in the recipe! If you try out the recipe using cooked lentils, report back on how it goes! Excellent recipe, easy to make. I prefer using rosemary and 365 vegetable stock from Whole Foods. I use a bit of veg. stock to mash the potatoes. Thank you for another great meal! I absolutely love this recipe! It’s so delicious, filling during this cold winter season. 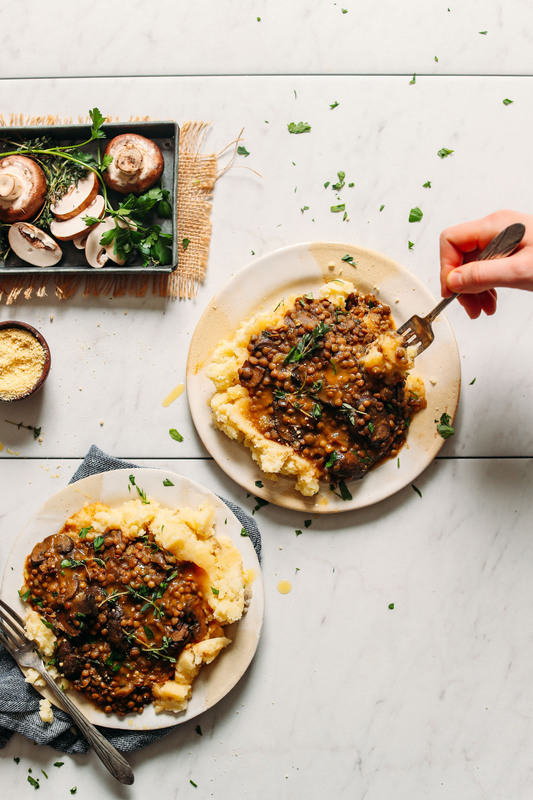 Nothing beats fluffy mashed potatoes and comforting lentils and mushrooms. Thank you!! I made the mashed potatoes the night before in my instant pot. I used the same amount of potatoes and put just enough water to cover them in the instant pot, then cook on high heat/pressure for 10 minutes. Instead of using vegetable broth in the potatoes, I used the leftover potato-water. Yay! Glad to hear that, Jillian! I made this and my husband loved it! I’m making it again tomorrow for some friends. Goes well with a side of lightly fried green beans + mushrooms + garlic. Made it exactly as stated and all I can say is- amazing! Comfort food perfected! MAKE IT! The short YouTube video and the short list of ingredients convinced me to make this recipe. Next time, I need to double the amount so I have some leftover. I didn’t have coconut aminos, so I used soy sauce instead. Great for winter! So. Good. I made this for a potluck and everyone loved it! So hearty and filling. I made noodles on the side so it was more of a pot-roast kind of dish. I had some leftovers so I just added a little bit of leftover tomato soup to them and it was delicious! This is such a versatile dish that you can really make your own. And so simple for me, as someone who doesn’t cook a lot. I’ll definitey make it again. I made this for dinner and it was so good! I didn’t have coconut aminos and I intended to substitute with soy sauce but totally forgot. I added powdered coriander and laurelinstead of thyme and added chopped fresh tomatoes instead of the tomato paste. It was delicious, and I will do this again without a doubt. Delicious! I used soy sauce instead of the coconut aminos! Soo good! I didn’t have a couple of items so I substituted dried basil, shiitake mushrooms, red onion. and I added fresh dill in my potatoes. I will definitely be making this again. Thanks for sharing your recipe changes! We are glad you enjoyed it. I really liked this recipe but with my bouillon broth squares it got a bit salty, at least for us. I cook the lentils now as a side dish instead of tofu now. I think a little white or red wine in the gravy would really work here. Keep an eye on this as it cooks as you definitely may want to add more broth to keep it saucy! Mine dried up a bit. I see someone else blended a little of the gravy and I love that idea! Thanks for this yummy recipe – just made for the 1st time tonight! My ‘meat-loving’ hubby even liked it. I sub’d in Tamari Sauce for Coconut Aminos (didn’t have). I did use the tomato paste, plus added a generous splash of red wine. Very happy I doubled the recipe – leftovers! Came out perfect as usual! I made it with red lentils (because I didn’t have green) and used soy sauce instead of coconut aminos (same reason). I’m not vegan and everytime I make a recipe of yours I just can’t believe how delicious and umami it comes out. Yay! We are so glad to hear that, Amit! This sounds so easy and based on the comments very tasty. I’d like to try it but I don’t have the coconut aminos what can I use as a substitute? Beautiful video and music. Thanks. Going to try this next week. We hope you love the recipe! I made this for dinner tonight. Wow!! Easy to prepare but so delicious! I can’t wait to eat the leftovers tomorrow. Thanks for sharing this recipe. It’s a keeper! We’re glad to hear that you enjoyed it, Leah! SOOOO good. I subbed sweet potatoes and mashed them with light coconut milk (GAME CHANGER, amazing discovery) and threw in some kale with the lentils at the end. So yummy, haven’t had mushrooms in forever and this was a great way to put some to use! Thank you! Just made this. No changes , perfect as is! My 7month old loves it too. I think this might be Thanksgiving Dinner! I made this my for dinner tonight and my spouse loved it! He told me next time to double the recipe! LOL Thanks… this was amazing! Looks delicious! Definitely making this for Thanksgiving for myself while the rest of my family eats turkey lol. This was delicious and easy to make!!! My family loved it as well. I followed the recipe as is, the flavor was amazing. Definitely going to make it again!! Thanks for the great recipe!! I am not vegan. But I am a vegetarian. What ingredient is the coconut aminos replacing? Could I use Worcestershire sauce instead? Or is it soy sauce? I made this tonight and it was really delicious. Great comfort food. I cooked the mushrooms a bit longer than called for in the recipe because I like them slightly browned. I also didn’t have shallot so I used half a yellow onion instead. Will be making this again! This is soooo good! it’s unlike most other things I cook in terms of flavor profile but I love it! I didn’t use green lentils and I also added a little garlic powder + Trader Joes 21 season salute at the end. very filling and simple! I made this for dinner tonight. It turned out very well. I would definitely make this when my non-vegan friends and family visit. This is one of those comfort food recipes you can’t resist on crisp fall day. We are glad to hear that, Tara! THANK YOUUUUUUUU. My new go-to fall dish (now that fall has finally arrived in Philly! Fingers crossed!) DE-LISH!! I threw in some really tasty arugula from my local farmer’s market (crazy good). Yay! We are so glad you’re a fan of this recipe, Wendy! Delicious but mine didn’t seem to get as saucy…will make sure I have extra broth on hand next time! I made this last night using three large Portobella mushrooms and roasted garlic broth, it was delicious. What a great flavor combination. Dana, your recipes never disappoint! I made it and it was delicious! I work for a health care facility where I cook for home bound people with HIV and various cancers. I make a bunch of meals during the week and freeze them to be delivered every Tuesday. I wanted to start making one vegetarian or vegan meal a month to see how the clients like it so I started with this! A couple of changes- I added more veggies to the stew, spinach carrot and zucchini (because I had it on hand). Then I swapped out the yellow potatoes for sweet potatoes and cauliflower. I added brown butter, a little cayenne and minced garlic. Wish I could show you the pics, it turned out great! Thanks a lot! I made this recipe and it was so hearty and delicious. I put my cooked potatoes in the food processor and whipped them up and that was SO delicious with it. I added garlic powder and rosemary because I love that. My roommate who doesn’t like the texture of mushrooms loved it but had to eat around the mushrooms so when she made the recipe herself, she bought Pacifica brand mushroom soup and used that instead because she doesn’t like the texture. I know many people don’t love the texture of mushrooms so if it looks good to you, try that! This is one of my favorite recipes I’ve tried so far. I made this yummy and hearty dish this evening! Thank you! Thank you! I loved it so much I know it will become a go-to dish! I didn’t have potatoes but used yams instead. Yay! Thanks for sharing, Teresa! This was good and very filling! I ended up blending about a cup of the lentil mixture and mixing it back in to make it more of a gravy than a soup. I added garlic, blue cheese, butter and rosemary to the potatoes. This was delicious! I followed the recipe exactly and it came out great. It was especially good the next day as the flavors came together even more. It will definitely be in the rotation for dinners! Whoop! We are glad you loved it, Kim! Great! Glad to hear it, Melinda! How did you manage to cook your lentils in about 20 minutes? I made this recipe today, and let me tell you, it did not take 20 minutes. I soaked them over night, I cooked them for two almost 3 hours, and they were not soft yet. Did you do anything different? I’d appreciate some tips. Aside from the cooking time being long, the recipe is delicious. I was not in a peeling and mashing kind of mood, so I served over brown rice and it was amazing!!! I thickened with cornstarch. Next time over potatoes for sure. We are glad you enjoyed it, Karen! I made this for dinner tonight and it was absolutely amazing! I subbed soy sauce for the coconut amenos, since that’s what I had. I loved the flavors. My non vegan family enjoyed it as well. Does it have to be brown lentils for this recipe? I have a huge bag of red lentils I’m trying to use up – would they work here? or sorry – green lentils? May red lentils be used in place of green for this recipe or not recommended? Hi Hayley! You can, but red lentils cook faster and tend to become mushier. So if you’re OK with that, go for it! First of all, this was delicious!! The recipe is easy to follow and I’d highly recommend! Something about the combo of mashed potatoes and lentils was just absolutely heavenly. My ONLY critique/suggestion is regarding the cook time for the lentils. As others point out, 20 min on low is definitely not long enough. I didn’t time how long it took to cook after my 20 min timer went off, but very possibly was closer to 40 min. I waited until most of the liquid had dissolved from the 2cups of veg broth & it was perfect. The video was extremely helpful in showing the type of consistency that the strew should have after fully cooked. Love, love, love this recipe! The most delicious thing! I wish i had discover your website 15 years ago! I can’t wait to try the other recipes! I just made this and it is delicious!!! I added a bunch of chopped carrots to the lentils & mushrooms about 1/2 way through cooking (which did take about twice as long as your recipe indicates) but otherwise followed the recipe as is. I definitely will be making this one again and again! Thank you! I’ve made this twice now, first time when we were spending time on our 27′ boat, so needed something I could do on a two burner stove. It was delicious. Even better the second time when I made it back in my own kitchen. I soaked the lentils beforehand both times, and added less liquid. Thanks for a great recipe. The leftovers even taste wonderful cold straight from the fridge! I made this last night and had an unexpected additional person to feed but it was reasonably quick, very easy and tasted delicious – thank you. I think I may try and add a bit of squash next time as well to make it even more chunky. Squash would be a great addition, Gail! Wow. Amazing. So delicious and easy to make. Super comforting. I followed the recipe, only adding a little smoked paprika for the depth (had no tomato paste) and a bit of spice (because I love spice). Perfect though! Thanks for a great recipe. The recipe is genius and has seriously become one of my favorites. I used to have shepherds pie only on holidays because it was a three step process, now I have it weekly. I cook the gravy in my pressure cooker. Thank you! Ps, I just ordered your cookbook! Yay! We are so glad you love the recipe, Jill! This was so flavorful and lovely. 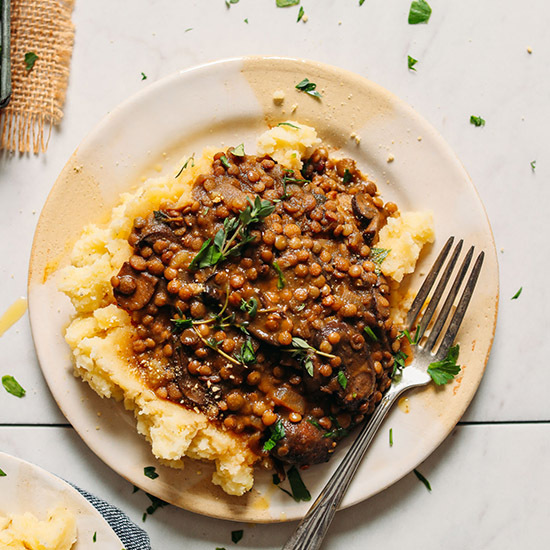 I’ll admit I was skeptical before making it, thinking there was no way such simple ingredients could come together into a comforting dish (and help me get over my craving for mashed potatoes, steak and gravy). And I was reeeeaaaally hesitating with those 2 tablespoons of thyme – it just seemed like an awful lot. But I trusted the recipe and went forward. Boy am I glad I did! I’m so surprised by how comforting and delicious this is! I made it for my meal prep, can’t wait to eat it all this week! I made it with cauliflower mash, which made it even healthier, but kept it satisfying. Thanks Dana, you’ve done it again! Yay! We’re so glad to hear that! Thanks for sharing! I made this dish, for my non-vegan family. I personally am vegan. They LOVED it!! Yes, I too loved it! I am adding it to my personal recipe book. Yummy! My family is always so skeptical, so it’s nice when they enjoy a non-vegan dish. Thank you for sharing!! This recipe is a hit at my house! Made it twice now and it is so good! It has such a delicious meaty umami quality to it! I did use russet potatoes instead of Yukon potatoes because that’s what I had but still so good! Yay! Glad you enjoyed it, Mandy! I’ve been looking for a way to use lentils that wasn’t in soup so that my one year old daughter could eat them more easily and this was perfect! 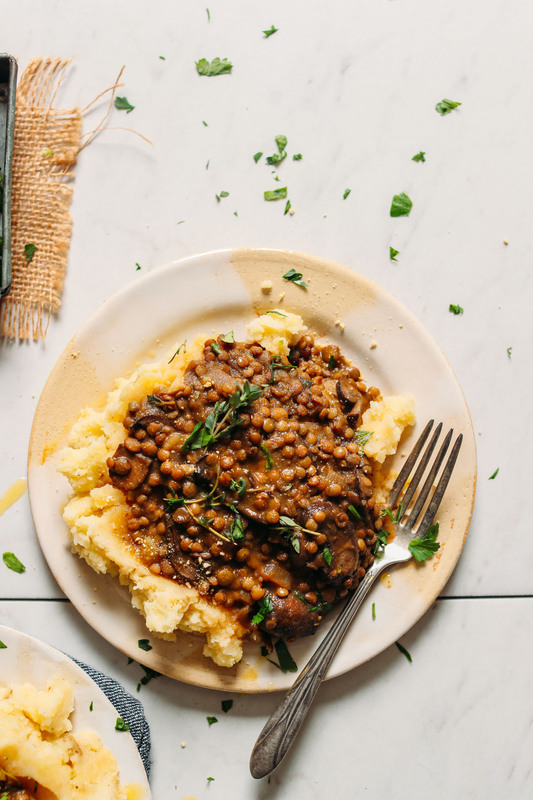 I didn’t make the mashed potato portion since I had some left over from another meal, but the lentil/mushroom portion was delicious and easy/fast to make for this busy mom! This was very flavorful! My husband does not always like that I try to make more plant-based meals, but he loved this dish, as did I. I will definitely be making this again. Thank you very much! I made this last night for dinner, and it was excellent. I didn’t have tomato paste, so I substituted red miso with a splash of apple cider vinegar, and it seemed to work just fine! I used rosemary instead of thyme, and rather than add the chopped herbs to the stew, I bruised a sprig of rosemary and added it to the pan, removing it after about 15 minutes. Rosemary can be overpowering for me, and this gave it a great flavor without being overwhelming. I made this and it was SO DELICIOUS!!! Hello , how i can substitute the coconut aminos ? I can skip it ? Hi Lidia! You can easily sub gluten-free tamari or soy sauce! Hi! I’m wondering if you’d know how this recipe would do in a slow cooker – just the stew. Trying to save on time after work, I’m thinking I’d prepare the mashed ahead of time. Thank you! Hi Alyssa! We haven’t made it in a slow cooker yet but if you try it out, let us know how it goes! Yay! We’re so glad to hear it, Jane! This is one of my favorite things I’ve cooked – I made some tweaks as I have no dietary restrictions and used what was on hand (butter and half & half in the potatoes, chicken broth instead of veggie broth, soy sauce instead of coconut aminos, included the tomato paste) – but I’m certain the dish would be good without my changes. I found the fresh thyme to be a key player in the flavor, so include it if you can! I served the dish in bowls topped some garlicky sautéed kale. It all held up wonderfully as leftovers as well. I also used an “autumn blend” of lentils – it included some softer red lentils that broke down and thickened the stew without needing to incorporate any of the mashed potatoes. We made this today and it was so good! Thanks for a great recipe. Will definitely make it again ? I have made this 3 times now. My husband and I are on the Whole Foods Plant Based Diet right now, so the first time I made this, I mashed the potatoes (and skins) with vegetable broth, and water sautéed the onions and mushrooms. Yum, yum, yum. The second time I made this, I forgot to get fresh thyme so I used dried thyme. So good. Also, I put it on top of baked potatoes. Less muss, less fuss, still good. The last time I made the Lentil Mushroom Stew I put it on spelt macaroni. My husband says that was his favorite way of eating it. By the way, I did not need to add the potato to thicken it. I am amazed at how simple, yet how yummy it is! Thanks! This was so good! I am having a ‘minimalist baker week’ – this is the fourth recipe of yours I made this week! We are not vegan so I made regular mashed potatoes since so far I have not yeat eaten vegan mashed potatoes that I enjoyed as much. I also used about double the amount of mushrooms because we just really love them. At the end we each added a teaspoon of nutritional yeast to our plates. The whole family enjoyed it, my 1-year-old ate almost an adult sized portion and my 3-year-old kept asking for more even after she’d had dessert! You’re on a roll, Kerstin! We are so glad to hear you have been enjoying the recipes! I made this and it turned out so amazing. Wow! Absolutely mouth watering. I just made this for dinner after eyeing for a while and it was even better than I already knew it would be. Thank you! PS: I ended up using a full 1 litre of veggie broth and the lentils took quite a bit longer to cook. We’re glad you enjoyed the recipe, Natalia! I made this for a Shabbat meal and my entire (carnivore) family loved it! I subbed the potato mash with cauliflower mash (fewer calories and more deliciousness ) and added dried chili flakes and fresh lemon juice for more flavor. Adding some of the mash to the stew for thickness was such a good tip! I made this and added some sliced carrot and vegan sausage. Also added some smoked paprika. Was delicious. Do I need to put coconut aminos in it? (I honestly don’t know what they are – I still have to do research). I’m allergic to coconut. Hi Emma! You can easily sub gluten-free tamari or soy sauce! Coconut aminos is a soy-free alternative to soy sauce, with a less pungent flavor. I usually double the amount of coconut aminos I would add to a recipe that calls for soy sauce. So, if a recipe calls for 2 Tbsp soy sauce/tamari, I’d probably add 3-4 Tbsp coconut aminos. Hope that helps! So good! Thank You, Dana! Glad you enjoyed it, Svetlana! Super easy to make and very filling! Will make again. Just made this – absolutely love it. I do feel it really needed more than 20 minutes to cook to soften the green lentils. Its another rainy day here and perfect dinner for a night like this. I tagged you in instagram with a photo. Hi. Did you cook lentil n mushrooms uncovered? This was delicious and as promised, comfort food. I used small portabellos and some sweet potato mash to thicken, and rosemary. It was worth making! Thank you! This turned out great! Super easy to make. I think next time I’ll try cooking the lentils separately, mashing them, and then adding them to the soup since my hubby isn’t partial to them. Yum! I made this one sunday for my dinners for the beginning of the week– so good! I did a mix of sweet potatoes and regular potatoes for the mash. – Canned lentils, instead of dried. – 1 cube of massel stock with 1 cup of hot water, instead of x2 cups of broth. Thanks for sharing your changes, Jes! We’re glad you enjoyed the recipe! Made this tonight and it was delicious! Definitely going to be on the regular rotation here. Thanks Dana! Woot woot! Glad you enjoyed it, Meridith! Dear Dana your recipes are the best. I tell everyone about your recipes. I purchased your book but have not tried those recipes yet. I am too busy trying the ones on your website. 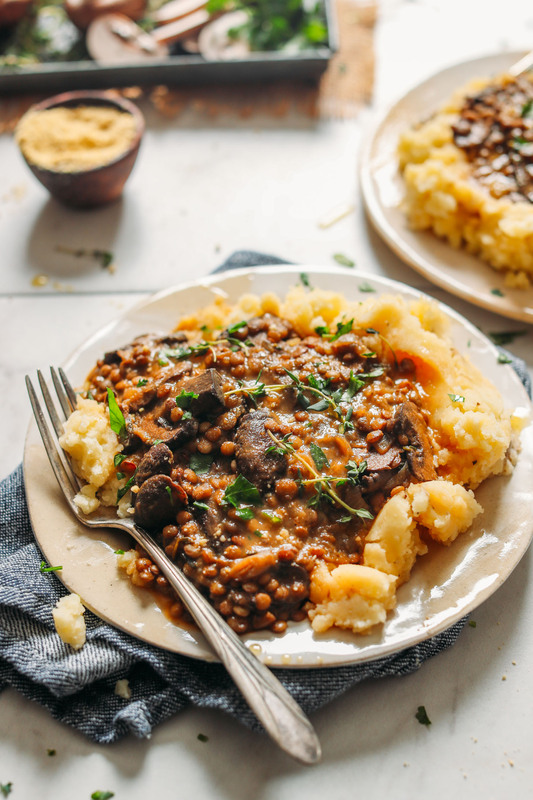 I tried the lentil mushroom dish and it was great! My dish was very very dark in color. Did I do something wrong. The taste was fabulous but the color was not very appetizing. We’re so glad to hear you’re enjoying our recipes, Diane! Did you happen to change anything in the recipe? I made this tonight (I was craving warm comfort food on another gray cold evening) and it was DELICIOUS!!! I didn’t have a shallot so I used half of a small yellow onion and added a couple cloves of minced garlic. Also used Braggs liquid aminos instead of coconut. Can’t wait for leftovers tomorrow!! Thank you!!! Yay! Thanks for sharing, Rennae! Hi, I would just like to say that this is my favorite thing I’ve ever cooked! I subbed the lentils for split peas and ended up using a food processor for the mashed potatoes (I like ’em real creamy!). Yay! We’re glad you enjoyed this recipe! Loved how savory this was…did not pull the stems off of the thyme and I do regret that! I also did not find the 12-15 cooking time for the potatoes sufficient—I did 20 minutes and they still came out tough-ish (I promise I put them in boiling water!) but I really was surprised by how flavorful this recipe was!!!! Loved this! It is going to become one of the staple recipes in my rotation. Its hearty and filling without feeling heavy. I made it to bring for lunch this week. It tastes even better reheated. I snuck some kale in with the lentils to get a little more green in my diet. I also added a dash of worcestshire sauce. Made this last night, it was delicious! I think I will add more veggies next time-carrots, green beans, celery, peas all sound good. This is absolutely delicious and goes together quickly. I’ve made it twice now, once with some modifications based on what I had in my fridge, and this time as is, with the exception of I used mushroom broth in place of the veggie. I like it with the tomato paste. This will be a go-to from now on. Thanks for the fantastic recipe. Perfect for Canadian “spring” weather with freezing rain! Made this tonight and everyone loved it! So delicious and the house smells amazing! Will definitely make it again soon! This was my first venture into cooking mushrooms and I’m so glad I tried this recipe! I love that your ideas are always easy to follow and have great end results. No pinterest fails here. Thank you! Yay! We’re glad you enjoyed it, Jen! Absolutely delicious! I will definitely make this again. Maybe we’re just big eaters, but I shared this with one other person and we finished it all, so I might double it next time to have leftovers or if I’m serving three or four people. I made the recipe as written, except using soy sauce instead of aminos and dried rosemary instead of fresh. I soaked the lentils and had no problem digesting them. Thanks for another absolute winner of a recipe Dana! Made it. Really yummy even though I changed things due to not having ingredients! Used onion instead of shallot and chicken broth (sorry ;) instead of veggie broth. Served over a mix of yukon gold and cauliflower mash. Next time I’m going to try tamari instead of the coconut aminos because they seem to be a bit sweet. Really enjoyed it! Served with fresh sauted asparagus with garlic. I maya add some fresh spinach next time. Thanks for a wonderful recipe! One of my all-time fav Minimalist Baker recipes. Super easy to make and the flavor is AMAZING! I added fresh garlic and kale to the lentil mixture and it was ?. I also added the tomato paste and loved it, and I used Tamari instead of coconut aminos. My boyfriend had two HUGE helpings. PS – the smell of sautéed shallot + garlic + tamari is to die for ? We’re so glad to hear that, Christie! Thank you, this was incredible. I took the time to make your vegetable broth the previous night and made this stew for dinner last night. Wow. It is an incredibly tasty and hearty meal and took no time at all to prepare. I hate substituting anything in a tried and tested recipe but I could not find cocnut amino here at all so I did have to swap that out for Maggi seasoning. Thanks again for sharing, this is a keeper! Lovely, thanks for sharing, Sam! This was wonderful! We made it following the instructions but left out the coconut aminos. Simply delicious and very filling! Awesome! I just made it for dinner. Since I wasn’t planning on making mashed potatoes (I served on a bed of steamed kale), I added a baby potato with the lentils and then smashed it at the end to thicken. I did add the tomato paste – not because it lacked flavor but because I was curious. Highly recommend!! Thanks for a great dinner! I just made this for dinner and it’s great! Easy to follow and execute. I have made many recipes from your blog and have loved them, thanks! If I soak the lentils beforehand, do I still use 2/3 of a cup (since they expand)? Or should I measure 2/3 c before soaking? Additionally, should I adjust the amount of broth if I soak beforehand? Use 2/3 cup of dried lentils before soaking and you shouldn’t need to adjust the amount of broth. So delicious! Followed recipe to the tee. Didn’t need the tomato paste or extra seasoning. The only sad part was that there aren’t any leftovers. I’d double the recipe for lunch the next day. Just had this for dinner and it was so delicious! I had to add extra water as the lentils were simmering, but other than that, I followed the recipe exactly. I happened to have an open can of tomato paste, so I added that and the addition was lovely. Love the idea of adding mashed potatoes to thicken the gravy! Will definitely be making this again! Yay! We’re glad you enjoyed the recipe! Made this on one of the first autumn feeling days or the season for my partner and we both loved it – thank you ! Yay! Glad to hear you both enjoyed it, Caitlin! We’re so glad you and your daughter enjoyed it, Kat! I didn’t have any coconut amino’s or soy sauce, so I subbed Worcestershire. The flavor somehow was just like a Sunday roast, so good! You always make the best recipes! Commenting again to give this recipe 5 stars! Thanks for sharing your recipe sub! needed three cups of vegetable broth. Next time I’ll add more mushrooms. I served it with steamed cauliflower. I made this tonight, and it turned out super yummy. It’s a great comfort food, vegan style. Thanks for this great recipe, Dana❤️? We’re glad you enjoyed it Sandy! Made this tonight. The best lentils I have cooked, ever! I added carrot because when I think of lentils I think of carrots. Used Tamari instead of the aminos as that’s what I had. I also made a cumin oil to drizzle over. I don’t know.. I have been craving certain flavors lately. A wonderful dinner. Thanks. I used water to Sauté, subbed better than bouillon for broth and yellow onion for shallot, left out the tomato paste and salt, and used an Italian dry spice mix instead of the herbs mentioned. I did have to add quite a bit more water than was called for but that may have been because the stove I was cooking on doesn’t have low enough heat to simmer. I didn’t miss the oil or tomato paste at all. It was a huge hit! I will definitely be making it again. Yay! Thanks for sharing your recipe changes, Shannon! This was excellent! We will definitely be making again and again! Made this tonight with half cremini/half shitake mushrooms and tamari (halved amount) instead of coconut aminos. Was absolutely fabulous! Would add less oil to the potatoes next time as I found them a bit dense. I am trying to eat more plant based for various reasons (I am not vegan) and this will make its way into my regular rotation. The flavors definitely compete well with meat-based dishes!!! :) thank you for another wonderful recipe Dana!! Would have loved to give it an extra half star haha ! Thanks Dana, this was delicious. My non plant based husband LOVED it. The flavor was very rich and well balanced. Just made this. SO tasty. I saw the pictures and thought no way could it be as flavorful as it looks, but it is. Adding this to my rotation for sure! I made mashed cauliflower in lieu of potatoes and added a side of roasted carrots. Made this last night, was absolutely delicious. I used canned lentils as it was all I had, so I used a little less broth and it turned out great! Even my 4.5 year old loved it! Next time I will double the recipe, as I’m sure the leftovers would be even better. Lovely, thanks for sharing, Julie! I am making this recipe today… I can’t wait… it looks delicious. All the recipes I have made from your website are delicious… thank you for all your hard work. Yay! Glad to hear it, Jessica! Went to the grocery for potatoes but put them down to buy avocados and then forgot them! So I made mashed cauliflower with sauteed garlic and rosemary. I needed way more water and way more time to cook the lentils, but despite that, it was delicious! Absolutely wonderful! Didn’t use nor need the tomato paste, lots of flavor. Will certainly make again. I am just dying to know what the song is in the video demo you did? Can you share? I made this last night and it was delicious. I used barley instead of lentils and it was a hit (so creamy, like risoto and tasty). Thank you for the recipe and for the hug. Yay! We’re glad you enjoyed it Lara! Thanks for sharing your recipe sub! This is crazy delicious. Thanks for such a terrific recipe, as always. Made this tonight and doubled the recipe since I figured I’d want extra. It made about 5 entree portions, so spot on! The green lentils took way longer than I anticipated – 40 minutes and still a little al dente. May cook them a little in advance next time. Flavors so good! Will make again. Thanks for sharing your experience, Corey! I had a similar experience, my lentils weren’t done for over an hour. Lentils: my personal Everest. I’d definitely soak the lentils beforehand if I made this again. Didn’t think your recipes could get any better, but here we are. This was perfect timing too, as I had some mushrooms I wanted to use up. My lentils and mushrooms didn’t turn out as stew-y as yours did, despite using 3 cups of broth in addition to more water, but I think that could have been because my stove is finicky and difficult to get mid-range temperatures (it’s either blazing hot or lighter than a simmer), so my temp could have been too high. I think next time I’ll add even more mushrooms. Other than that, flavors were spot on. Major comfort dish here; seriously recommend. lol, love Owen! And this comment. xo! So. Good. Added garlic to the potatoes, and some butter. Yummmm. SMART! Thanks for sharing, Emily! This was delicious! I added some fresh spinach. So simple but probably one of the best dinners I have ever made! My carnivorous parents devoured it and wanted more. Made it exactly as you stated but without shallots, instead I just added about a tablespoon or so of onion powder. It was divine, thank you so much!! Made this last night and it was another hit! We recently moved to Switzerland from the U.S. Since I don’t have a full–time job I’m doing all the cooking. At first it was so stressful (to add to it my husband is a chef) but I keep going to your blog again & again and now I look forward to cooking dinner. Some of the ingredients aren’t available here (for example, baking soda isn’t sold here as a cooking ingredient, you can only get cleaning grade baking soda) but I creatively substitute. A thousand thanks! Yay! We’re glad you enjoyed it! Boni, you can definitely get baking soda in Switzerland. It’s called Natron and sold in the baking aisle. One popular brand is Dr. Oetker. Thank Sara! I found some at COOP now that I know the proper name in German! This was AMAZING! I made it with just a few changes:) I used a package of tempeh, cubed and sautéed with the shallots instead of the lentils, and mushroom broth in place of the veggie. Served over mashed turnips. I can’t wait to make this again – trying it with lentils. Your vegetable broth looks devine! Do you make your own? I either use my DIY (https://minimalistbaker.com/easy-1-pot-vegetable-broth/) or Imagine brand. Made this for lunch. It was delicious!! Great recipe!! What would be good to add to get an extra kick of protein? This is actually quite protein rich! But you could double the lentils (just add more broth to compensate). You are amazing! I cannot wait to make this! Oh gosh it looks great… Making me starving now! How I wish I can grab a plate of that on my desk now. Looks amazing. Would canned lentils work? Yes! Just cook for less time. I had a bunch of potatoes that needed to be used, and when I saw your recipe today I knew I had to make this. It was delicious! Thank you for this recipe and all the others you have shared with us. You are amazing!! Yay! Thanks for sharing, Rose! Why have I never thought to do this? I always whine that shepherds pie takes too long. This is perfect! I need to make this! Looks so delicious. Would Braggs liquid aminos Work in place of the coconut aminos? You’ve done it AGAIN! Your my favorite food blogger! Your so gifted and ahelping so many people with allergies, autoimmune, and people who just want healthy recipes that taste good! Everything works , tastes great, and is simple. Our family had used your recipes for years -time to review! So kind – thanks Heather! Sounds like a wonderful dish! I never combined lentils and potatoes except with Indian food. Can you use any other kind of potatoes or even sweet potato? When I make your lentil chili or sloppy Joe’s, I serve the leftovers over mashed potatoes with (your recipe) garlic parmesan green beans…we have this every week…so good! I cook almost exclusively from your cookbook & website & I thank you for making our transition to vegan eating so easy & delicious! I can’t seem to find the garlic parmasean green beans, and I’d really love to try them. Please link them! Gonna make this recipe tomorrow! Sounds delicious. Any suggestions on what I could do to swap out mushrooms? My family claims to not like them. Roasted carrots on top sounds sooo good to me! Totally making this recipe! Thank you!!! Could you sub red lentils? You can, but red lentils cook faster and tend to become mushier. So if you’re OK with that, go for it! How about brown lentils instead of green? Looks like reverse vegan shepherd’s pie. I’m digging it. What is coconut aminos ? I’m living in Mexico and not sure if I can find this item ….what could I substitute with?? You can easily sub gluten-free tamari or soy sauce! Coconut aminos is a soy-free alternative to soy sauce, with a less pungent flavor. I usually double the amount of coconut aminos I would add to a recipe that calls for soy sauce. So, if a recipe calls for 2 Tbsp soy sauce/tamari, I’d probably add 3-4 Tbsp coconut aminos. Hope that helps! Thanks, was about to ask the same question … Great that I checked :-) will definitely be making it. YUM! This would be SO DELICIOUS over GF/DF polenta too! I am imagining a mashed potato bowl with the potatoes as the base, this stew on top and to the side, and add some greens to the bowl, maybe collard greens, sautéed with onions and garlic and maybe even a roasted red pepper into the mix… Shopping today, making this for tomorrow. I love your recipes and how imaginative they are. You inspire me! Smart! Thanks for sharing! Hope you love it. Great idea! Actually, I am making this tonight, with asparagus and mushrooms. Cannot wait to try it. Technically it’s Spring here but just had massive rain showers coming down. In other words: while the season asks for salads, the weather (and me) wants comfort food. This seems just perfect for tonight, though I think instead of mashed potatoes I’ll go for polenta (and use some potato starch to thicken the sauce if needed). Agreed! It’s still cold and rainy in our neck of the woods. Comfort food it is! this looks great! would you think this would be good if it were over cauliflower mash to save some calories? Lisa, I was thinking the exact same thing!